For a while now I’ve wanted to draw myself on the bridge of the I.A. Star Banger, so I seized the opportunity. And, Whoot! This was the last strip for book 2. I have things lined up with the printer and it should be all on schedule. Excited! Oh, and it means I have to finish plotting book #3 by Monday. Oh dear. 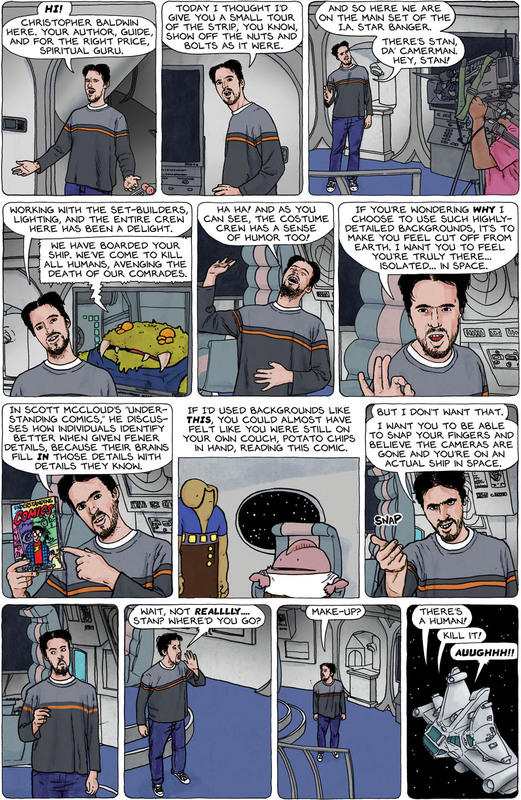 And you may remember I mentioned that you might maybe feel the desire to nominate “Spacetrawler book 1” for a Hugo Award under the “Best Graphic Story” category, here is a final reminder (which I utterly lifted from Howard Taylor’s Schlock Mercenary blog with his permission). Damn. And I thought that Stan would wind up being the new, breakout, dark horse star of the comic. I hope Christopher did not really get eaten …. it looked so realistic with all that great detail and stuff. …… Love your great artwork Chris. You are a good story teller with a great sense of humor. You look kinda Rasputin-ish in panel nine. This was really fun, Chris. I for one agree about the backgrounds. Great little behind the screen piece, but who is that scruffy imposter? As we all know the real Chris is a dashingly hansome man of great power, not some poorly groomed ‘character’. Hey, Chris, I love the realistic style in which you drew your self-portrait. There was another strip of yours I read in which you drew yourself in a similar style; I can’t remember what it was, just that it was black-and-white and it was another instance in which you were addressing the fourth wall. Anyway, I’d love to see you do an entire strip in that style. Hey, maybe you can use that approach for Book 3! If not, possibly your next project? @SteveGallacci, been working non-stop since November, it’s taking its toll. It’s taking its toll. @Rafi, Perhaps the into to I Am Hans Krunkel? _Drive_ updates so infrequently now that I’ve kind of lost patience with it. So many other good things about it, though. Panel 1 looks exactly like a body-gesture that I now consider characteristic of Scott Meyer over at Basic Instructions. Ha ha. Except you have more hair still. Okay the look in panel ten is priceless! Where’s that Bar-Bot when you need him Chris?! Is there a reason half of those poses look like they’re inspired by Basic Instructions? I think this is only the second time I’ve ever laughed out loud from an expository filler strip outside continuity. It’s really cool of you to explain some of the reasoning that goes into your work – but even if you hadn’t, I assure you that your awesome backgrounds don’t go unnoticed, and that they have the very effect on me that you describe. in a scene’s background, as a stowaway on the Starbanger. Have to say I agree 100% about backgrounds – I’d read that McCloud line somewhere before (haven’t read the book) and it never sat right with me. I’ve seen otherwise engaging and well written sci-fi comics like Kris Straub’s ‘Starslip’ undermine themselves with a lack of environmental context and detail. Spare backgrounds can be useful as detailed ones can be. I find them both useful. I just have to be careful not to over do the detail. An your work is great! You have that balance an your sets look right. The best compliment I can think of is that I don’t usually notice your backgrounds unless they are relevant to the story. They are so real in appearance. Well done again!!! PS it reminded me of the old TZ where Rod Serling would appear in the beginning on set an sometimes later depending upon the story. Quick, click your heels together three times! There’s … arrgghhh, don’t eat me, don’t eat me!! To those who asked about the similarity to “Basic Intructions,” It is a fine strip, I’m flattered, but, no. I simply had Beth take pictures of myself walking through the motions and I drew from those. I’ve been doing realistic work in this method since about 1998 when I drew health-pamphlets for my day job. The instrument filled background didn’t seem alien or disconcerting to me. Rather it put me in mind of my Navy days, Military ships have lots of compartments that have a lot of hardware, controlls and plumbing showing, so do military aircraft. I would have congradulated you on how well you simulate shipboard scenery, a famiailiar environment for me.